« Autodefense Wing Tchun for men and women – in English! 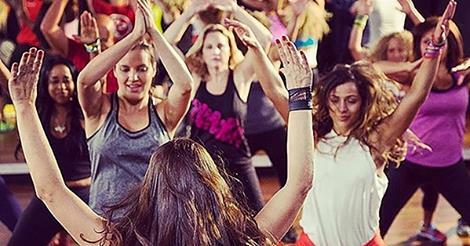 Do you know what is Zumba? Fit has never been this fun! It is not a dance class, it is a party! No one is judging you by your dance abilities, just have fun, dance to great music, with great people, and burn a ton of calories without even realizing it. Katka (our teacher) is certified Zumba instructor for almost four years and even though she found Zumba by coincidence, for her it was love on a first sight. During approx. five years it helped her not only by physical side, but mostly by psychical side. She could have tons of problems, when she came to the class, she left all behind the door. After two years of attending on Zumba lessons at her home town I realized that she feel comfortable enough to move on, so she found instructor training and made a certificate. During her first year as Zumba instructor she had 5 classes per week and learnt how to work with people, improved herself and felt in love with it even more. What is the best part of being Zumba instructor? ‘Energy sparkling from all the people, who are repeating my steps, smiling and enjoying the lesson. To see that they are improving, getting into rhythm, getting more flexible, getting moves more smooth… And when they come after lesson to me with a big smile and say it was great, they had fun and forgot their troubles. This is the biggest worth of it.